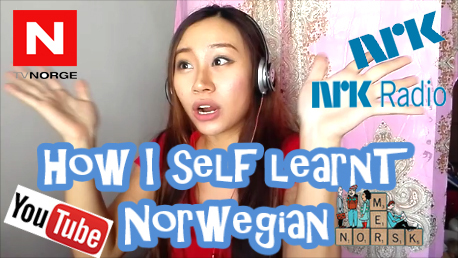 It's been sometime I had been learning Norwegian from Home and have not been to a Norwegian class and if you are wondering, can you self learn Norwegian without going to Class? YES YOU CAN ! I can now even watch Norwegian movies or dramas without subtitles at all ! My method of learning Norwegian language is proven to be effective to only those whom puts efforts and are very keen and interested in learning the norwegian language. Pratice makes Perfect and I can't say I speak perfect Norwegian yet but I am still also in a Learning progress and I won't stop learning and so would you even if you think you are good enough. Norwegian language is useful as it also relates to Swedish and Danish. You might even find it easier to find job in Norway if you can speak their language well as it shows you made effort and am serious to be in Norway. Otherwise, you might find some language or group barier when surrounded by a bunch of Norwegians and not understand their funny or interesting conversations at all. So learn Norwegian Language and dont give up as you might surprise yourself ! All you have to do , start, is just through YOUTUBE and some sites I had recommended on my videos ! I'm still in learning progress but way much better than before ! !